Sapphire blue with green Peacock design. Elegant, Decorative. 1. The pillow cover measures 18″ x 18″ (approximate 45cm*45cm) The size may have a deviation of 0.5cm due to produced by different date. 2. Color: Sapphire blue/green, Peacock print and both sides are the same. 3. The pillow cover is made of high quality fabric and is very durable, enviroment-friendly and very comfortable . 4. This cushion cover has an invisible zipper and all seams have been overlocked so it’s easy to wash it. 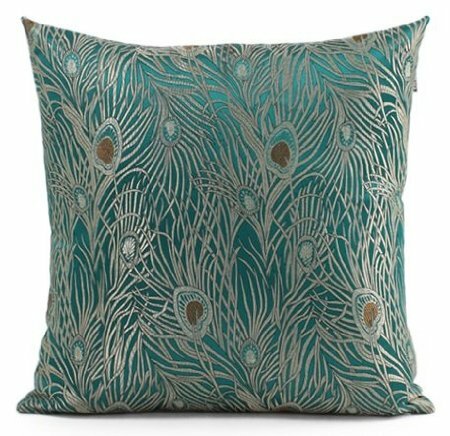 Urban, simple, modern pattern and neutral, this pillow cover will adapt to any kind of decor and make you home more special! please note the item does not include filler, just the cover only. Care: Wash in cold water at gentle cycle or by hand. Do not use bleach. Dry flat or hang to dry. Iron upside down at cotton temperature with steam.